My personal favorite druid set,in terms of aesthetics. It is also the set Arktos, the Feral Druid from the card game, wears. I hope I'll be able to gather it for my Night-Elf Druid. It's a shame the leggings are not a skirt/kilt as that ould make theis set perfect. I am fairly certain there was a skirt/kilt that used the same texture as the leggings tho for the life of me I can't remember where, tho after scanning through all TBC dungeon loot I can't find anything so I am thinking it may have been a quest reward. Wrist Slot is useless because the gloves completely cover the wrist. Helm, Gloves, Feet and Waist Slot. Anybody know a good staff for this set? one that matches and not just a one that you personally like? After a good hour or so of searching for a staff to suit my Tauren druid, here are some staves I found for druids who want a matching or at least semi-matching weapon for this armor. 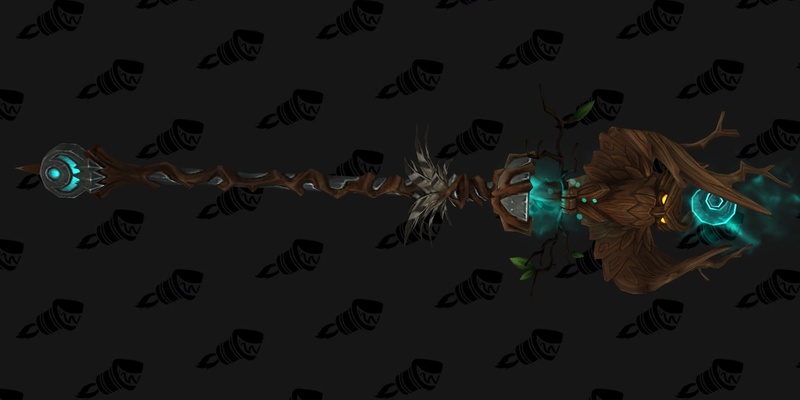 I hope this helped at least one of you, personally I think I'll be snagging either the Spire of Withering Dreams or Frostbit Staff for my Tauren druid. :) Best of luck! For anyone who would like to have robes to go with this set, I can suggest the Earthborn kilt. I'm looking for a cloak to match this set, looked through many and the best i could find is a white one with green borders though it doesn't match the "bage" or however that's spelled colour on the set. which back pieces do you use with this set? I think http://www.wowhead.com/item=61341#. would fit very well to this transmorg set! I use this set for my druid. I wear it with Drapé rubis du mystosophe for my cloak, and Bâton cœur-de-cristal à impulsions for my staff. Salut du gladiateur impitoyable can kinda fit, the glowy parts sorta match the shoulders, but could detract from the rest of the set. Marteau de cérémonie de Dathrohan I mention if you want something less BC-artsy, the brown of the haft can match the trim, and if you squint the bronze-ish metal isn't a horrible match for the beige. I went with the Brutal Salvation at first, while hoping for the Archon's Gavel. Currently the purple/orange glow from Enchantement d'arme (Torrent de puissance) covers up the color mismatch. Plus there's tons and tons of book-model off-hands. I'll add to this later if I find other/better matches. I've been trying since transmog came out, but for the life of me I can't get the boots to drop. Does anyone have a suggestion of a replacement that looks decent? edit: of course since I complained about it, I got them just now. If you would like to have a belt that doesn't just mesh seamlessly into the chest and legs, or are just having terrible luck getting the matching belt to drop, Ceinture cénarienne matches very well! This is especially handy if you would like to wear a tabard, as the belt that matches this sets makes wearing a tabard look odd. Also, for tabards, either the Tabard des Gardiens d'Hyjal or Tabard de l'Expédition cénarienne match nicely. Does anyone have any suggestions for alternative boots for the set? I find they are too thick and rise to high for my liking. Any suggestions are appreciated! Etançon d'instinct primal matches good with this set. Looks really good if you're a NE with purple skin. Grovewalker's Leggings are the actual match to this set, for those looking for a kilt. You can buy them for justice points. For those people who do not like the shoulders either because the blue gem gets in the way or because they would rather have a bit more green in them might i suggest Spallières des plaines sans fin, Châle sombre, or Epaulières vicieuses en peau de wyrm. all three are identical, match the greens and browns of the rest of the set, and have a spare pair of "horns"! and if you go with these shoulders then for staffs you can go with Sceptre de Celebras if you have it from before cata, if not then try Grand bâton de furie-du-fauve or Bâton étrangleur de Terestian for a decent match. The Undeath Carrier (Le Porteur de non-mort) is my favorite staff for this set. If you are after a matching staff, you can obtain Bâton de volonté tremblante in Normal mode Temple of the Jade Serpent at level 85. The Normal version is the blue and tan, matching the shoulder gems and the blue spot on the kilt, Jambières de marcheur du bosquet, for this set perfectly. The Heroic version of the staff is red. I think the Libérateur d'âme fits quite nicely. The heroic version of the Libérateur d'âme has the same skin. People keep saying 'Grovewalker's Leggings' are the actual match, but I'd like to know the item shown by the NPC mentioned above - thanks! I've found Couteau de brèche d'archonte (Couteau de brèche d'archonte) goes well with this. Drops from Trial of the Crusader 25.
the best tabard to go with this set is the Tabard of Nature which you can find here. the best staff to go with this set is the Staff of Immaculate Recovery. This is my all time favorite Druid Transmog set. Here is the complete look, with Pillar of Ferocity as my weapon and Tabard of Nature. Just piecing together a set from what I have on hand and came up with this. I don't actually have the polearm, but I think it might work. It could be a little too pink, but it's worth a shot. You can see this on my druid's armory page (as of the date of this post). If anyone's looking for a good belt, Ceinture du briseur de cages en cuir is a good choice & easy to get, for levels 85 and above. For the perfectionists like me, the bracers are not useless, But a part of a full 8piece set. They drop from Attunen the Huntsman in Karazhan. First Boss. This cloak matches the set perfectly: Royal Cloak of Arathi Kings. It is dropped by Moroes. Another well-looking staff with this set is Dreambinder. 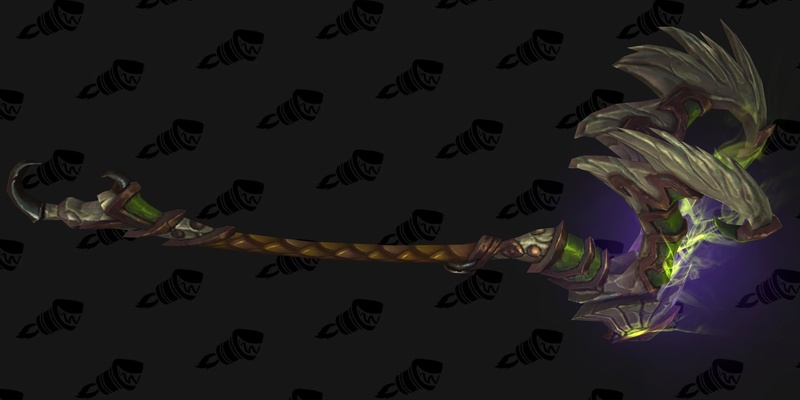 I offer Caducée de zénitude de Giorgio from the LFR Throne of Thunder as a staff that matches. The coloring goes with the gold/brown of the armor trim and the teal egg in the center is a darker version (at least on my screen) of the blue/green gems on the shoulders. Caducée de zénitude de Giorgio might go all right, but it's very autumnal in color (reds/golds/browns/kind of a pink), so probably not as much. The other, Caducée de zénitude de Giorgio, is a blue/green version that might have worked...if it hadn't been so blue. Maybe you'll like that one. The staff model itself picks up the feather motif of the shoulders and the animation for it is falling feathers. It's good for RPers that say their druids work for Aviana. When I get bored of that staff, I swap to the Bâton des espoirs déçus. This one's good for RPers that say their druids work closely with the Emerald Dragonflight. For the cloak, I'm stuck with Xing-Ho, Souffle de Yu'lon at the moment (since heirlooms are un-transmoggable), but the occasional green wings that pop out match the set pretty well, even if the cloak itself doesn't. Eventually, it will be replaced, so I'll swap between Cape viridienne and Drapé de gardien du bosquet. If you're looking for different boots and still have these kicking around in your bank, you could try Bottes d'intuition périlleuse or Sandales de l'eau de mer (same skin). They're no longer available, but I found at the time that the green matched the armor, even if the gray detailing might be a little off. For those who wants antlers, there's a helm alternative that actually fits with this transmog. It's actually kinda same but it's a good alternative for helm. I like to use the Belt of Bloody Guts for the waist, the Staff of Trickery for the wep and Keepers of Time Tabard to finish it off. If you're going for the tabard, don't forget that you can earn reputation via timewalking dungeons. So if a BC timewalking event is near, get your rep through that. That would've saved me loads of time. I love this set, but for years I wondered if it could be updated with boots and gloves less bulky. After I found the boots and gloves I was interested in, I ambitiously wondered "What more could be done?". This; , was my answer. the green "Warden's Crown" https://wow.zamimg.com/uploads/screenshots/normal/554326.jpg hidden appearance. or the brown "Night's Vigilance" https://wow.zamimg.com/uploads/screenshots/normal/554331.jpg Mage Tower Challenge appearance (if you were able to complete it before it was removed).